Shop for Breast Cancer Awareness at Plum Pretty Sugar! Creating awareness for Breast Cancer is so important to us here at Plum Pretty Sugar. This month we are supporting the cause with a fun promotion we wanted to share… a free “Hello Pretty" tote and a donation to Susan G. Komen. 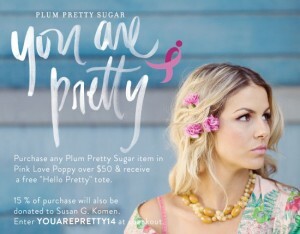 Purchase any Plum Pretty Sugar item in Pink Love Poppy over $50 and receive a free "Hello Pretty" tote. 15% of the purchase will also be donated to Susan G. Komen. Enter YOUAREPRETTY14 at checkout. We hope you help us support the cause and want to spread the word as much as we do! Additional creative for the campaign is availaable within the interface and please let us know if there is anything we can provide to aid your Plum Pretty Sugar Promotions.